With a considerable increase in energy costs followed by an incline in Canadian inflation rates in the recent months, there is some speculation that the effect on the consumer price index (CPI) caused by high energy costs should fade later this year. CPI is the Bank of Canada's preferred measure of inflation. There does seem to be some underlying momentum in core CPI which, if kept continuing, will be much harder for policymakers to brush aside. Global economic growth was weaker than forecasted for the first quarter in 2014 but is expected to pick up in the second half of the year. As for now, the rates are anticipated to remain unchanged until 2015. There is much consideration that the new normal for interest rates is that it will be much lower than previously. The interest rate will see fluctuations in the short-run, however, in the long-run, the interest rate should be in line with the economic growth. Canada's potential growth rate has slowed down in the recent years due to the low productivity growth, the global financial crisis aftermath and the aging workforce. The Canadian labour force growth is correlated with the production of goods and services growth. Thus, both growth rates will follow the same declining pattern. 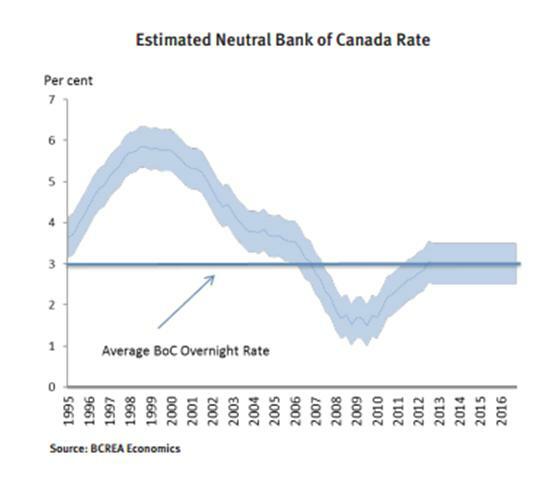 Economic growth in the coming periods may be a little slower than in previous eras and thus, the appropriate interest rates for the Canadian economy may consequently be lower than in previous eras.